Helen Thompson runs her own health food shop in Bawtry, South Yorkshire. Yet despite her knowledge of healthy eating, she still found it extremely hard to shift her post-pregnancy weight. “After I had my son, who’s now four, I went up to 15 and a half stone,” says Helen, 34, who now has a second child, a 10-month-old daughter. “Like lots of women, I had put on a lot of weight and was finding it extremely hard to lose. 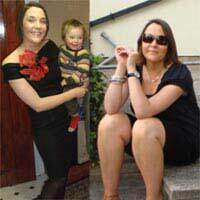 As Helen owns her own health food shop, she had come across lots of products in the past that promised help with detoxification and dieting. “I'd had success with many of these products in the past, but the simplicity and the quick results that this detox offered really appealed,” she says. Many people advocate the use of a detox plan, which they say has myriad health benefits, if done only for a specific period of time by healthy people with no serious medical conditions. Proponents of detox plans say they help cleanse both body and mind, and are an ideal way to prepare people to start a diet. The idea behind them is that they get rid of built-up toxins in the body, and not only help people lose weight but also give them an improved complexion, thicker nails, shiner hair, more energy, and an enhanced sense of well-being. Normally, Helen takes regular supplements, but she decided to forsake them during her detox and concentrate on the drink in its entirety. “I loved the taste of the lemon detox and made up my entire amount first thing in the morning for each day,” she says. "This meant that I could drink it continuously, particularly if I got any hunger pangs during the day. Saying that, Helen said the very beginning was a bit tricky. “Days two and three were a little tricky, as I felt a little cold and tired. I found that drinking the warm mixture really helped me to feel better. “For the rest of the week I had loads of energy, clearer skin and eyes and my overall sleep improved a lot. I found no problem continuing with my everyday life, which included looking after my family, and running my busy health food shop and therapy centre. “I felt really brilliant throughout, and it was nice to do a cleanse. The best thing, though is that I lost 11 pounds in just one week, which was a kick-start to my diet plan." A few months later Helen went on the detox program again, and lost a further eight pounds - meaning she lost almost a stone and a half in all. “Now, through healthy eating and the use of a personal trainer, I have got back down to 11 stone, which is fantastic,” she says. Helen now thinks she will do the detox as part of a regular maintenance program when she feels the need to either lose a few pounds, raise her energy levels, or both. “I think it’s a must before any big event or holiday, it makes you feel great and helps you to lose the weight,” she says. “Through my positive experiences with the detox I’ve been able to personally recommend it to both my personal clients and my customers in the shop.